The South Asian river dolphin (Platanista gangetica) is a freshwater or river dolphin found in India, Bangladesh, Nepal and Pakistan which is split into two subspecies, the Ganges river dolphin (P. g. gangetica) and Indus river dolphin (P. g. minor). The Ganges river dolphin is primarily found in the Ganges and Brahmaputra Rivers and their tributaries in Bangladesh, India and Nepal, while the Indus river dolphin is found in the Indus River in Pakistan and its Beas and Sutlej tributaries. From the 1970s until 1998, they were regarded as separate species; however, in 1998, their classification was changed from two separate species to subspecies of a single species (see taxonomy below). The Ganges river dolphin has been recognized by the government of India as its National Aquatic Animal. The Indus river dolphin has been named as the National Mammal of Pakistan. Further, the Gangetic river dolphin has been elected to be the city animal of the Indian city of Guwahati. The species was described by two separate authors, Lebeck and Roxburgh, in 1801, and it is unclear to whom the original description should be ascribed. 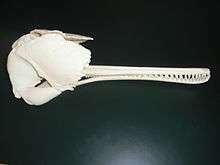 Until the 1970s, the South Asian river dolphin was regarded as a single species. The two subspecies are geographically separate and have not interbred for many hundreds if not thousands of years. Based on differences in skull structure, vertebrae and lipid composition scientists declared the two populations as separate species in the early 1970s. In 1998, the results of these studies were questioned and the classification reverted to the pre-1970 consensus of a single species containing two subspecies until the taxonomy could be resolved using modern techniques such as molecular sequencing. The latest analyses of mitochondrial DNA of the two subspecies did not display the variances needed to support their classification as separate species. 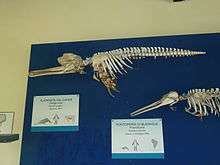 Thus, at present, this one species with two subspecies is recognized in the genus Platanista, the P. g. gangetica (Ganges river dolphin) and the P. g. minor (Indus river dolphin). The South Asian river dolphin has the long, pointed nose characteristic of all river dolphins. Its teeth are visible in both the upper and lower jaws even when the mouth is closed. The teeth of young animals are almost an inch long, thin and curved; however, as animals age, the teeth undergo considerable changes and in mature adults become square, bony, flat disks. The snout thickens towards its end. The species does not have a crystalline eye lens, rendering it effectively blind, although it may still be able to detect the intensity and direction of light. Navigation and hunting are carried out using echolocation. They are unique among cetaceans in that they swim on their sides. The body is a brownish color and stocky at the middle. The species has only a small, triangular lump in the place of a dorsal fin. The flippers and tail are thin and large in relation to the body size, which is about 2-2.2 meters in males and 2.4-2.6 m in females. The oldest recorded animal was a 28-year-old male, 199 cm in length. Mature females are larger than males. Sexual dimorphism is expressed after females reach about 150 cm (59 in); the female rostrum continues to grow after the male rostrum stops growing, eventually reaching approximately 20 cm (7.9 in) longer. The South Asian river dolphins are native to the freshwater river systems located in Nepal, India, Bangladesh, and Pakistan. They can be most commonly found in water with high abundance of prey and reduced flow. The Ganges subspecies (P. g. gangetica) can be found along the Ganges-Brahmaputra-Meghna and Karnaphuli-Sangu river systems of Bangladesh and India, although its range formerly extended to Nepal. A small subpopulation can be still found on the Ghaghara River and possibly the Sapta Kosi River. 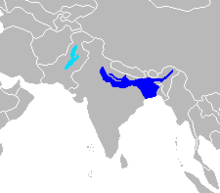 The majority of the Indus subspecies (P. g. minor) is located between the Sukkur and Guddu barrage in the Sind Province of Pakistan. Two smaller subpopulations have also been recorded in the Punjab and Khyber Pakhtunkhwa Provinces. Since the two river systems are not connected in any way, it is a mystery how these sub-species ended up in the two rivers. It is improbable that the river dolphins made it from one river to another through the sea route since the two estuaries are very far apart. According to Land of the Seven Rivers: A Brief History of India's Geography by Sanjeev Sanyal, a likely explanation is that several north Indian rivers like the Sutlej and Yamuna changed their path in ancient times and carried the dolphins with them. The South Asian river dolphin feeds on a variety of shrimp and fish, including carp and catfish. They are usually encountered on their own or in loose aggregations; the dolphins do not form tight interacting groups. On the 20th of May, 2013 India’s Ministry of Environment and Forests has declared dolphins as ‘non-human persons’ and as such has forbidden their captivity for entertainment purposes. Some scientists postulate that dolphins and whales are sufficiently intelligent to justify the same ethical considerations as humans. As a consequence in order to keep dolphins in captivity one must provide a legally sufficient reason for their imprisonment. 1 2 3 Smith, B.D. ; Braulik, G.T. (2012). "Platanista gangetica". IUCN Red List of Threatened Species. IUCN. 2012: e.T41758A17355810. doi:10.2305/IUCN.UK.2012.RLTS.T41758A17355810.en. Retrieved 29 August 2016. ↑ A. Rus Hoelzel. Marine mammal biology: an evolutionary approach. Wiley-Blackwell, 2002. p. 8. Retrieved 2011-02-10. ↑ "Declaration of Gangetic Dolphin as National Aquatic Animal" (PDF). Government of India - Ministry of Environment, Forest and Climate Change. May 10, 2010. Retrieved October 23, 2016. ↑ "The Official Web Gateway to Pakistan". www.pakistan.gov.pk. Retrieved 2016-10-23. ↑ "Gangetic river dolphin to be city animal of Guwahati". The Times of India. 6 June 2016. ↑ Kinze, C.C. (2000). "Rehabilitation of Platanista gangetica (Lebeck, 1801) as the valid scientific name of the Ganges dolphin". Zoologische Mededelingen. National Museum of Natural History. 74: 193–203. ↑ "One Species or Two? Vicariance, Lineage Divergence and Low mtDNA Diversity in Geographically Isolated Populations of South Asian River Dolphin" (PDF). Journal of Mammalian Evolution. 22(1). 2015. doi:10.1007/s10914-014-9265-6. ↑ Rice, DW (1998). Marine mammals of the world: Systematics and distribution. Society for Marine Mammalogy. ISBN 978-1-891276-03-3. ↑ "Susu, the blind purpoise ... in the Ganges River, blind porpoise of Asia". The New Book of Knowledge, Grolier Incorporated. 1977. , page 451 [letter A] and page 568 [letter S]. 1 2 3 4 "South Asian river dolphin (Platanista gangetica)". EDGE. Retrieved 26 July 2011. 1 2 3 Boris Culik. "Platanista gangetica (Roxburgh, 1801)". CMS Report. Retrieved 24 July 2011. ↑ Swinton, J.; W. Gomez & P. Myer. "Platanista gangetica". Animal Diversity Web. Retrieved 24 July 2011. 1 2 "The Whale and Dolphin Conservation Society". Retrieved 24 July 2011. ↑ "CITES". CITES. Retrieved 24 July 2011. ↑ Bhagwandas. "Blind Indus dolphins' population increasing". Dawn metropolitan. ↑ Singh, L.A.K. & R.K. Sharma (1985). "Gangetic dolphin, Platanista gangetica: Observations on habits and distribution pattern in National Chambal Sanctuary" (PDF). Journal of the Bombay Natural History Society. Bombay Natural History Society. 82: 648–653. Archived from the original (PDF) on 2009-10-26. 1 2 3 4 "Appendix I and Appendix II Archived 11 June 2011 at the Wayback Machine." of the Convention on the Conservation of Migratory Species of Wild Animals (CMS). As amended by the Conference of the Parties in 1985, 1988, 1991, 1994, 1997, 1999, 2002, 2005 and 2008. Effective: 5 March 2009. ↑ "How Hinduism Continues to Save Dolphins in India". The Chakra News. ↑ Braulik, G. T. (2006). "Status assessment of the Indus river dolphin, Platanista minor minor, March–April 2001". Biological Conservation. 129: 579–590. doi:10.1016/j.biocon.2005.11.026. ↑ Gautama, Madhulika (2014-06-16). "Dolphins get their due". The Hindu. ISSN 0971-751X. Retrieved 2016-11-27. ↑ "Dolphins deserve same rights as humans, say scientists". BBC News. 2012-02-21. Retrieved 2016-11-27. Smith, B. D.; G. T. Braulik & R. K. Sinha (2004). "Platanista gangetica gangetica". IUCN Red List of Threatened Species. Version 2008. International Union for Conservation of Nature. Retrieved 14 November 2008. Smith, B. D.; G. T. Braulik & A. A. Chaudhry (2004). "Platanista gangetica minor". IUCN Red List of Threatened Species. Version 2008. International Union for Conservation of Nature. Retrieved 14 November 2008.